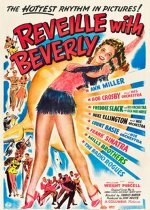 One of many B-movies churned out by super-hoofer Ann Miller, during her career with Columbia, this light-hearted and act-packed musical was actually based on the life and career of a real-life female disc jockey. Not that it matters, because Miller is simply fabulous, bringing her customary warm-heartedness and tap-dancing skills to this insubstantial film. Watch for a young and skinny pre-film fame Frank Sinatra, before the Brooklyn Paramount concerts (the movie was reissued after that gig). Here's Duke Ellington and Count Basie, and the Mills Brothers, too, all appearing in a servicemen's show organised by Columbia juvenile Larry Parks, three years before he became famous for The Jolson Story. All Ann Miller's programme fillers were short, bright and sassy, and this stands out only slightly from the rest as a collector's item.